What do community empowerment and a game of tic-tac-toe have in common? An underutilized area redesigned and rebuilt for positive gatherings. Led by Monica Chadha, adjunct assistant professor of architecture, a group of IIT students helped to transform part of a vacant lot as part of their Interprofessional Projects (IPRO) Program course Neighborhood Placemaking: Focus on Bronzeville. 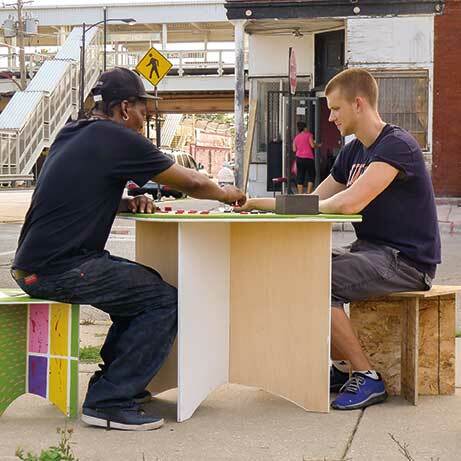 After surveying residents about their ideas for the space, which borders Bronzeville’s historic Forum Hall, the students created “urban activators”—a set of portable lightweight furniture, including chairs, game tables, and furniture storage bins that convert into refuse receptacles. Community members tested and helped to paint the pop-up furniture at a July 2012 launch party. The furniture is currently in storage in the Forum awaiting the return of warmer weather.